La Estancia is another P.B Dye creation on the island. With P.B’s style and architectural skills you will truly enjoy this fantastic inland golf course. 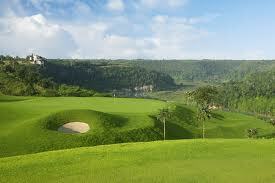 This course has many amazing holes, whether you are playing No. 2 with a long carry over a deep cavern or one of the Par 3’s along the Chavon River, you will find the views to be spectacular. No other inland golf course on the island can boast these vistas.